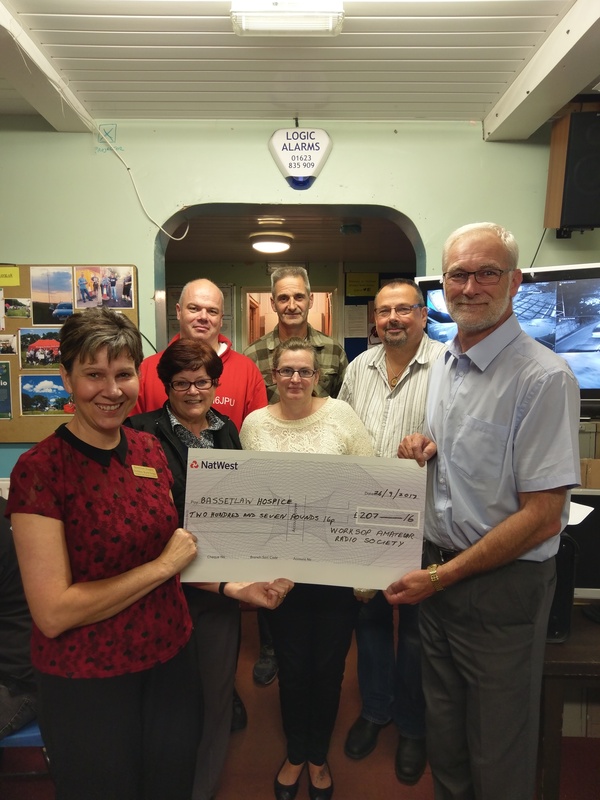 Back in April this year, some members of Worksop Amateur Radio Society, in conjunction with the Chesterfield Canal Trust, took part in a Boat-pull along the Chesterfield Canal, (which runs through our area) to raise money for our local hospice. Some of you kindly sponsored the team of ‘boat pullers’ and we raised over £200. We recently arranged a cheque presentation and Debbie Rawlings, Community Fundraising Co-ordinator received the cheque on behalf of Bassetlaw Hospice. Debbie went on to give a short talk on the work of the Hospice and how important donations are. Bassetlaw Hospice which is located in Retford, provides palliative care for patients who have been diagnosed with cancer or a progressive long term conditions. It exists to support the patient and their families to achieve the best quality of life.